A poor guy told @MahaBahnassy in Tahrir : you should go home, so when we die you guys can build the country. You are the educated ones! 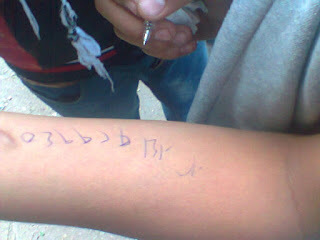 A 15 years old boy was writing his mother's phone number on his arm so when he die they can reach her to ID his body! Personally, I won't forgive or forget the Egyptian Army crimes against its people. SCAF can say whatever they want. And the corrupted controlled Egyptian State Media can air whatever to find excuses for these crimes.